A marksman living in exile is coaxed back into action after learning of a plot to kill the President. Ultimately double-crossed and framed for the attempt, he goes on the run to find the real killer and the reason he was set up. Bob Lee Swagger, one of the world's great marksmen and the son of a Congressional Medal of Honoree, is a loner living in the Rockies. He's left the military, having been hung out to dry in a secret Ethiopian mission a few years before, when he's recruited by a colonel to help find a way that the President of the US might be assassinated in one of three cities in the next two weeks. He does his work, but the shot is fired notwithstanding and Bob Lee is quickly the fall guy: wounded and hunted by thousands, he goes to ground and, aided by two unlikely allies, searches for the truth and for those who double-crossed him. All roads lead back to Ethiopia. OK, when my sister took me to the theaters she said "what do you wanna see?" Instantly I thought Shooter because I'm a Mark Wahlburg fan and I love actions =). So we seen that. The acting in it was GREAT. I found the only ones lacking at some parts, were Donnie's wife (I'm sorry, I don't remember her name! )I just found she played a bit of an anorexic, depressed woman a bit too much. But as for Micheal Pena (which some might remember from World Trade Center) played the rookie cop so well, and he could make his acting go from intense to kinda silly in 5 minutes. For my last review is Mark Wahlburg, I haven't seen that many of his movies (I'm forbidden to watch Boogie Nights!) but his acting in this was spectacular, he played the old shooter, almost cynical alone person scarily well. But my favorite thing was HE SHOWED PAIN, he wasn't "ouch, it hurts!" He was obviously hurt. For the plot, the plot was amazing, a little hard to get your mind around it but still a great plot. Then with the action sequences and the explosions, very well done. So, while this movie may freak out some kids. The adults will love it =) So it deserves a 10/10 in my mind :) I extremely disappointed with Shooter, because I had expected a fast paced action movie with great action scenes, but waited, waited and waited. It has potential, but the movie is too slow paced, no enough action and also action scenes are mild, it does not rock. Visually it looks good, but nothing more. There are some action movies which slow paced and mild and unfortunately, I guess it is just bad luck, in some of them, there is Mark Wahlberg. Shooter and Max Payne for example. I did not like Max Payne at all (and almost everyone did not) because to me, it was too slow paced either. We believe the posters, the trailers, but the movies become disappointing. At the beginnings of the movie, in the scene that Swagger tries to save the president from the assassination, there is a goof; the bad cop's visibility distance is perfect and he is not an amateur, but he misses Swagger. Is it possible that he does not want to do it? May be, otherwise, it is a goof. Returning to action, absolutely, I don't call this movie action, it is a thriller (but a bad one) The biggest action scene is the one takes place in the/in front of the cottage. However, even this is not long enough and seemed me mild. The snowy scene on the mountain is well visually, but not an action scene. Our man is wounded and goes to a woman and those parts steal a lot of time of the movie. Why they do that? Because of lack of enough budget? No, I don't think so. Because, directors are too lazy to make action scenes which is backbreaking? May be. 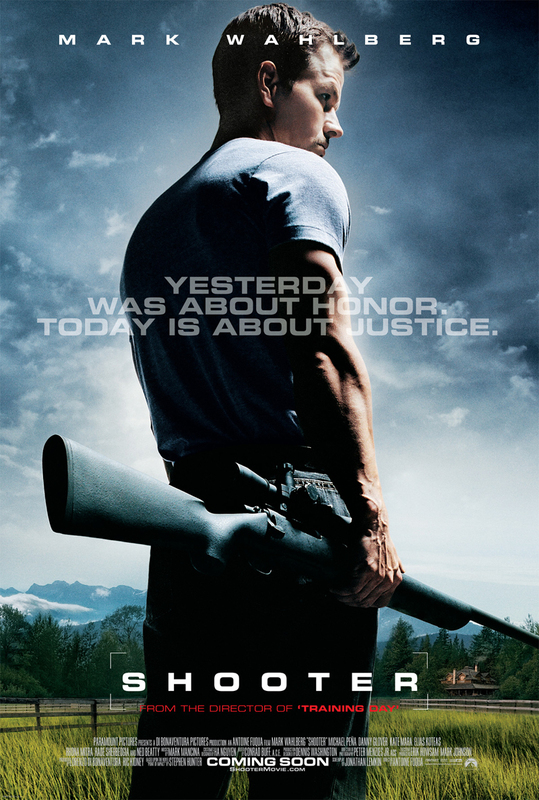 Think about The Shooter and think about Die Hards, Mission: Impossibles, Bourne Supremacy etc. If you still think that Shooter is an action packed, then there is nothing about it. The ultimate crime of this paranoid enemy-of-the-state pulp, directed with more style than brains by Antoine Fuqua (Training Day), is how dull it is.